Another month means another Fourth Doctor adventure from Big Finish, this time the Time Lord is in Budapest navigating his way through a labyrinth; but will we want to get lost in this story or will we be dying to escape? The Fourth Doctor appeared to have a penchant for attempting to take breaks and holidays at every opportunity but they rarely seem to go well. It also appears that the Fourth Doctor has a tendency to leave K-9 behind in the TARDIS whilst he and his companions go to relax; something that is explained why in the opening moments of this release of the Fourth Doctor Adventures from Big Finish (and before you ask, no, K-9 hasn’t just been a bad dog). It’s apparent that the Doctor and Romana II are more like equals than the ‘conventional’ Doctor/ Companion dynamic, probably because Romana is a Time Lady who is arguably more intelligent than the Doctor, however the representation of her character never seems to be big-headed or egotistical at all. Mark Bonnar, one of my favourite Big Finish actors is present in The Labyrinth of Buda Castle as the apparently mysognistic and rather dastardly Zoltán Frid who is portrayed as a very slimy individual who seems to have an attraction to Romana II. If you’re wondering where you’ve heard the name Mark Bonnar before, he played The Eleven in the rather brilliant Doom Coalition box set featuring the Eighth Doctor. If you’ve read the synopsis, you’ll be aware that this release features vampires and a vampire hunter who is seeking to find Count Dracula; arguably the most famous vampire next to Edward and Bella. The vampire hunter, Celia Soames, is insistent that the Doctor is in fact the Count, however the Doctor echoes exactly what most English Literature students wish exam boards would understand, “Sometimes writers just write things”. Why are certain people so keen to overanalyse every detail is beyond me. Anyway, I digress; when listening to these Big Finish releases, I always know that I’m going to be entertained, however it’s not every release that also includes an interesting lesson too. I’d like to thank the writer of this release, Eddie Robson, for teaching me that Dracula was inspired by Vlad The Impaler. One thing I really enjoy in Doctor Who is when the Doctor seemingly acquires a new companion, meaning that his regular companion can go and have adventures of their own. This is why I quite like Series 8’s Flatline as the principle is relatively the same. 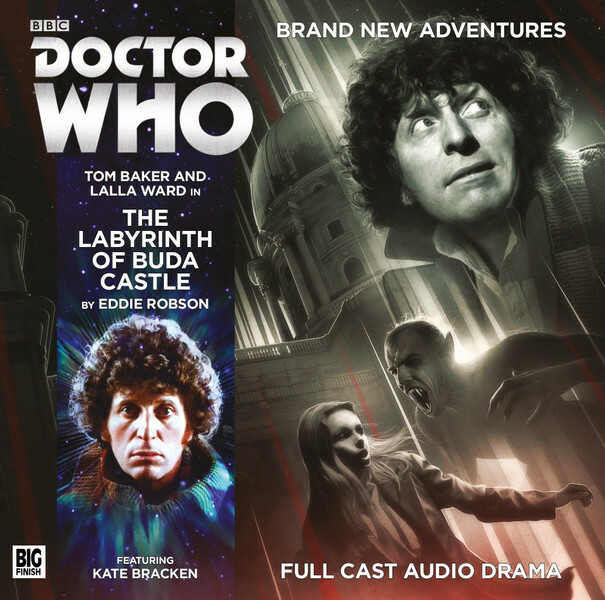 In this release, the Doctor and Celia go into the labyrinth of Buda Castle whilst Romana II is busy with some important detective work for the Doctor. I personally feel that this works extremely well with the Fourth Doctor and Romana II because the Doctor is extremely open, warm and friendly to people he likes, and because Romana II is of equal, if not greater intellect to the Doctor, she’s able to easily hold her own and maybe be even more efficient whilst working alone and not having to drag the Doctor around by his scarf as he gets distracted. Celia, despite being a vampire hunter, seems to be extremely compassionate about other human beings; when I think of vampire hunters, I imagine the likes of Van Helsing who appears to just focus entirely on the job at hand, Celia however seems to be much more human than the stereotypical vampire hunter and I think that it adds a great character trait to her. The fact that the Doctor has to tell her that humans have a habit of trying to cause pain and misery to one another as much as possible seems to really upset her; not that she has much time to be upset. If there’s one thing that I really don’t talk about enough in these Big Finish reviews, it’s the quality of the editing. Towards the end of the first episode of the story; there’s a brilliant few scenes that are edited brilliantly together, making the listen much more captivating. We cut quickly between the Doctor and Cecila in danger, with loud snarls and panic straight to Romana and her investigation, being solemn and quiet and understanding. We’re then taken immediately back to the danger which is a great way to audibly portray the juxtaposition of the scenarios that the characters have seemingly got themselves in. Doctor Who has this great narrative device that is uses, where the Doctor is apparently in terrible danger, it transpires that he’s not in the most terrible danger possible, so it then throws him into that terrible danger. The great thing about Doctor Who is that this means that we get great cliffhangers; like a kettle whistling. No joke. Of course, with Doctor Who, the resolution to the cliffhanger is never quite what it seems either, and The Labyrinth of Buda Castle is no exception; if there’s a parallel of characters, I’d say that the opening scene of the second episode is a lot like one between Sherlock Holmes and Moriarty, in the fact that they’re not at each others necks (or throats with the threat being vampiric) but instead they’re rather complimentary of one another, marvelling at each other’s skill sets and accomplishments. Like last months release, Wave of Destruction, there are elements of the story that somehow go from the sinister to the somewhat silly in a matter of seconds. (Sibilance is great isn’t it?) I really enjoy it when Doctor Who does this, especially with the Fourth Doctor, as it reflects exactly what Tom Baker’s tenure on the show was like, making this story feel right at home alongside it’s TV counterparts. I know I go on and on in these Big Finish reviews about how I don’t want to talk too much about what happens in the story as I don’t want to spoil it for anyone who’s planning on listening to these releases in the future, but the second episode of this two episode long story features lots of threads that could potentially spoil either the outcome of the release or spoil certain parts of the first act that are more entertaining to uncover yourself than have me tell you. I’m not sure whether it’s just me being more observant recently or whether it’s becoming more and more of a trend in Doctor Who, but water keeps seeming to be an the equivalent as a ticking bomb; being something that means the action has to move forward quicker, however I quite like the fact that the writers have near unlimited scope as to what a menacing driving force of a story could be in a show such as Doctor Who, but they decide that the best device is the threat of getting wet. Well, I suppose they could drown, but we’re British, we’d probably just complain about soggy trousers. Overall, I thoroughly enjoyed The Labyrinth of Buda Castle; like most Big Finish stories it does have its flaws, the setting I feel was somewhat under-utilised as the majority of the cast were English, it would have been nice to have a more Hungarian cast, although I do understand that it was probably hard to find English speaking Hungarians that were available. Without these slight disappointments, this is a thoroughly dark yet silly Doctor Who story; it feels like it could have been written by Douglas Adams or in the similar time period. I’m glad to report that it seems like the fifth series of Big Finish’s Fourth Doctor Adventures won’t be slowing or degrading in quality any time soon, and I’m throughly looking forward to next months release, The Paradox Planet. The rating system on the Gallifrey Archive is achieved on a scale of 1-10. Should you want to purchase The Labyrinth of Buda Castle it is available now from from the Big Finish website. The price is £8.99 for the download and £10.99 for the physical CD.